A fishy appeal? - Patent my French! It is not an easy task to report on case law from the EPO Boards of Appeal, as there are so many commentators in the blogosphere (and elsewhere) poised to jump on any fresh decision that being original is tricky, unless you do high frequency posting. Nevertheless, I am wondering whether decisions drafted in French might as a general rule fly a little bit more under the radar, since French is certainly the official language of the EPO which is the least spoken by the European patent profession. With that in mind, here is a report on one of these low flying decisions, which I find noteworthy for two reasons. 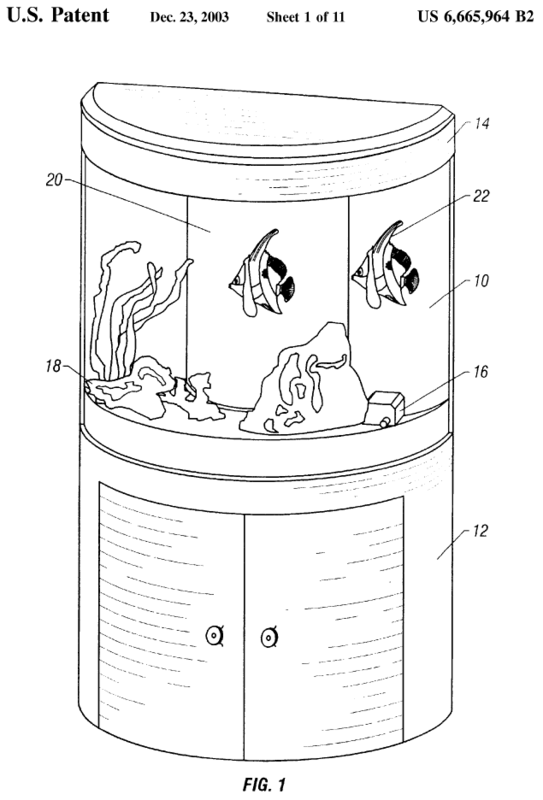 The first reason is that the main claim of the patent in suit was directed to a container containing precooked tuna fish, which opens up an ocean of possible aquatic puns for this blogger. And the second reason is that the decision deals with an interesting point of law regarding the burden of proof in appeal proceedings. The patent owned by Brittany-based Etablissements Paul Paulet had been revoked by an opposition division due to insufficiency of disclosure. – the container contains only the foodstuff and a gas, wherein the volume content of dioxygen in the gas is less than 15%, the gas being nitrogen. Both features of the characterizing part of the claim were viewed by the opposition division as raising implementation issues. If we focus on the liquid content feature, the opposition division noted that the patent taught to place the precooked fish into the container, add liquid nitrogen which will be turned into gaseous nitrogen, then close the container and sterilize the product. Based on various statements made by the patent proprietor during the opposition proceedings and information contained in the patent itself, as well as in an experimental report referenced as T4 (filed – unfortunately – by the patent proprietor), it could be concluded that, during the sterilization step, the liquid content in the container can change, and in particular can increase or decrease. Many factors may influence this change in the liquid content, including the type of fish, the precooking procedure, the shape of the fish, the additives and the conditions of sterilization. The opposition division deemed that the patent did not teach how to control these various parameters. With its statement of grounds of appeal, the patent proprietor filed a modified version of claim 1 as a main request (corresponding to one of the auxiliary requests discussed in first instance). In this modified version of claim 1, the material of the container was somewhat restricted, and the nature of the fish was further specified to be “pre-cooked tuna fish in solid form“. With the summons to oral proceedings, the Board expressed the preliminary opinion that there was an issue of sufficiency of disclosure with the liquid content feature, although it did not share the view of the opposition division regarding the other feature of the nitrogen / oxygen content. One month before the oral proceedings, the patent proprietor submitted a new document T18, which was an experimental report focusing on the processing of tuna fish. The admissibility of document T18 at this late stage of the proceedings was debated in front of the Board, in view of R. 13(3) of the Rules of Procedure of the Boards of Appeal. therefore the patent proprietor had reacted in a timely manner by filing the new experimental report T18 focusing on tuna fish. The Board rejected the argument by analyzing the first instance decision, which mentioned a number of ill-controlled parameters influencing the liquid content and not just the type of fish; and by noting that the main request in the appeal was the third auxiliary request in first instance and had thus also been rejected by the opposition division. the burden of proof of insufficiency of disclosure lies exclusively with the opponents, in all circumstances. This also applies on appeal further to a decision revoking the patent for insufficiency of disclosure, notably when the grounds of the decision at stake no longer adversely affect the appellant due to a modification of the claimed subject-matter (reasons, 1.4.1). The Board rejected the argument in view of the very nature of the appeal proceedings. The respondents brought forward elements during the opposition proceedings which were apparently sufficiently credible as to the impossibility to carry out the invention in a systematic and reproducible manner by relying on the information contained in the patent; moreover, this information would be too limited and contradictory. This led the opposition division to hand down the decision at stake, which was duly reasoned. This decision not only brings an end to the opposition proceedings, but also as a consequence assigns different roles to the parties for the appeal stage. Once the patent has been revoked, it is up to the patent proprietor as the appellant to take a more active part and present, firstly, a detailed argumentation in its statement of grounds of appeal, even if by filing a new set of claims the grounds for the challenged decision seem to be overcome. The appellant cannot simply wait for the respondents to demonstrate the invalidity of the patent. The patent proprietor, as the appellant, must therefore act against the challenged decision, that is, must, in the present case, demonstrate that common general knowledge does make it possible to carry out the invention based on the patent. This demonstration must be complete and not selective, without waiting for the Board or the parties to invite it to develop it more. In this respect, the appeal proceedings are not a continuation of the opposition proceedings but a new procedure instituted by the appellant. Therefore, the principles which initially governed the opposition proceedings are no longer necessarily applicable at the appeal stage, and those stated in the Rules of Procedure of the Boards of Appeal replace them, notably the duty to provide the complete means in view of which the decision cannot be maintained. A patent proprietor who thinks that they can discard the basis for the challenged decision owing to grounds of appeal limited to only one aspect of said decision runs the risk of later being in a situation where the filing of additional grounds or evidence during the appeal proceedings may be considered late under articles 13(1) and/or 13(3) RPBA (reasons 1.4.2). I think it is fair to say that the burden of proof of insufficiency of disclosure on the opponents is a very heavy one in opposition proceedings. However, according to the present decision, the onus shifts on appeal, if the patent is revoked by the opposition division. More generally, it can be derived from the Board’s comments that the first instance decision is presumed valid until the contrary is proven – although I am not sure that this has often been stated in this way in the case law. On the merits, the Board reached a similar conclusion as the opposition division regarding the unpredictability of the liquid content in the container after sterilization, and therefore dismissed the appeal. The parties will have the opportunity to continue the discussion and fish for further arguments on the liquid content feature, since there are opposition proceedings pending in connection with the divisional patent, and since the same feature is present in the independent claims. My guess is it will be an uphill battle for the patent proprietor but at least they can hope to be able to rely on the additional evidence that the Board has refused to take into account in this case. CASE REFERENCE: Board of Appeal 3.2.07, T 30/15, Etablissements Paul Paulet v. Princes Limited & Bolton Alimentari S.P.A, January 20, 2016. It might be bitter to be told that appeal proceedings are not the continuation of first instance procedures, but there is nothing more true. If a decision adverse to the proprietor is taken by an OD than the onus of proof lies with him in appeal. See for instance T 1159/12, point 7, albeit in examination. In T 1378/11, point 2.2 it was made clear that as a matter of principle, the legal burden of proof lies with the party who makes the assertion. The legal burden of proof that the patent is lacking inventive step thus lies on the opponent. However, if the patentee relies on an improvement, the burden is on the patentee to prove that, compared with the closest prior art, there is an improvement. The mere assertion that an improvement exists is not sufficient to discharge the burden of proof. What has been said here about inventive step applies mutatis mutandis to sufficiency. Another constant in the case law of the BA is that a communication from the Board is not an invitation to file further documents, e.g. T 1459/11, Catchword, or T 1932/12, even if this is done within the time limit under R 116(1), as it is an amendment to a party’s case, point 3.1. Filing experimental data within the time limit under R 116(1) has never led to success, as it would deprive the other party the possibility to make counter tests. See for instance T 816/13, point 4.4.3, T 1402/12, about food processing, point 2, or T 390/07, where the experimental data was even submitted by a third party. Would late filed experimental data be admitted at such a late stage of the procedure, it would mean postponing OP, a situation the BA do not like to be pushed in, and hence they are refused under Art 13(1 or 3)RPBA. This is only accepted by the BA in exceptional cases, see for instance T 2456/10, point 2, or T 639/11, point 1. If experimental data are filed in appeal, they should better be filed at the beginning of the appeal. See for instance T 737/12, point 1.1.3, or T 205/11, point 1.2, in order to show novelty. The decision should not have come as a surprise for the proprietor. He took a great risk when filing his appeal, see point 1.4.2, last §. As there are divisional applications in the pipe line, the last word is indeed not said. Wait and see if the defence of the proprietor improves.